DNA samples have been collected from Medieval (late 1300s) graves in Warmia (Ermland) recently. So possibly we will get Old Prussian aDNA, although at that time the area already had other groups as well. In year 1218 population of West Balts is estimated to be around 220 thousand, of which 170 thousand lived in areas which later became part of East Prussia (with Warmia). It is known that Old Prussian language died out at some point in the 1st half of the 18th century. In the 1500s and 1600s there were still publications in Old Prussian language, including Luther's catechism. Despite extinction of language, I estimate that up to 1/3 and no less than 1/5 of East Prussian DNA comes from Old Prussians. Last edited by Tomenable; 09-10-2018 at 01:05 PM. If you read Polish, there are many interesting papers published by Pruthenia or by Komunikaty W-M.
Last edited by Tomenable; 09-10-2018 at 01:27 PM. Thanks for sharing... does professor Lapinski also talk about noble families with those haplogroups presented in the video? People wonder why were Prussians assimilated but Latvians and Estonians not. The main reason is because immigration of foreign ethnic groups (not only Germans) to Prussia was on a much larger scale, and much more of it was rural (Baltic Germans in Latvia and Estonia were virtually all nobility and townsmen, there were no German peasants there - unlike in Prussia). Total population was about 450,000 of which 80% were Latvians in 1795. 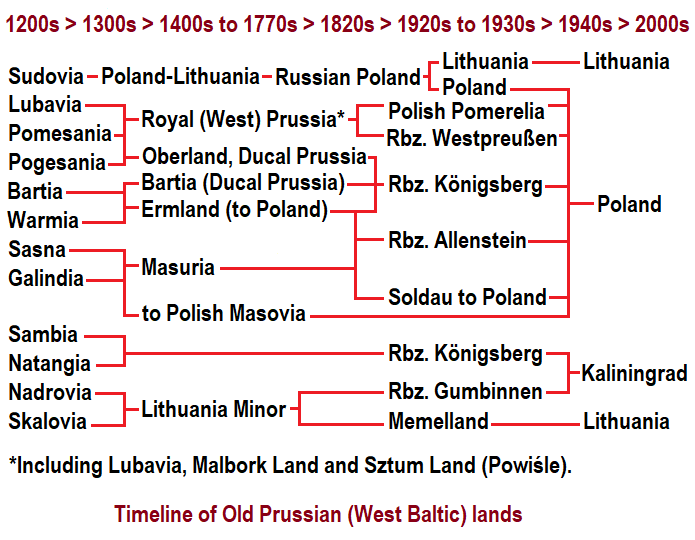 For comparison, Native Prussians were barely 1/2 of entire population in East Prussia already back in 1405. There were up to 1000 (one thousand) villages with German settlers (those villages were not exclusively German but majority German-inhabited) in East Prussia by year 1405 - and probably no such villages in Latvia and Estonia, where rural settlement of German peasants generally did not take place. Duchy of Courland later became Courland Governorate of the Russian Empire. Courland Governorate had the highest % of ethnic Germans out of all "Pribaltika" (which included also Livonian Governorate and Estonian Governorate - the latter is Northern Estonia). In late 1790s and early 1800s the capital of Courland - Mitawa (Mitau) - had about 9,000 - 12,000 inhabitants of which half were Germans, 1/4 - 1/3 Jews and the rest mostly Latvians. does professor Lapinski also talk about noble families with those haplogroups presented in the video? Yes, all families tested are noble families (the lecture is about Y-DNA of nobility of the Polish-Lithuanian Commonwealth). Mazovia had the highest share of nobility of all regions of Poland - almost 1/4 its entire population were nobles. That was caused by necessity. During the Early-High Middle Ages, Mazovia, a border region of Latin Christendom, was frequently raided by Pagans and Non-Catholics (Prussians, Lithuanians, Russians, Tatars, Mongols, etc.) and needed a hell of a lot of knights for wars. So a lot of population of Mazovia became knights and later they were nobility, in total 20-25% of inhabitants. Last edited by Tomenable; 09-10-2018 at 04:13 PM. Could someone please give a brief translation regarding Z92 - YP270 movement from Łukasz Łapiński talk? I am YP-4479, and my paternal family line is from the Augustow area, since at least the middle 1700s. Dziękuję bardzo. Within so called Royal Prussia, only Lubavia and Pomesania were actual Prussian lands. Last edited by Tomenable; 10-08-2018 at 09:50 AM. As per Lithuanian archaeologist Sudovians were divided into four groups all had different exoethnonyms given to them by different ethnic groups: Yotvinians, Dainava, Sudova, Poleksian (Slavic exothenonym by the look of it). He also describes geographic locations of the settlement on the territory of what is today north-eastern Poland, western Belarus, south-western Lithuania. Before the Prussian Crusade (which started in year 1218) there were those 12 realms. After the Thirteen Years' War, most of Lubavia and Pomesania became parts of Polish Royal Prussia (the remaining parts became portions of Oberland - Upper Prussia - western part of Ducal Prussia). Lubavia was incorporated to Chełmno Voivodeship of Royal Prussia, and Pomesania (a less historical Polish name for this region is Powiśle, or "Land beyond the Vistula") to Malbork Voivodeship. Most of Pogesania became part of Oberland in Ducal Prussia. After the crusade Bartia was partially incorporated into Warmia (Ermland) within its new borders, and partially remained a separate region. Galindia and Sasna became known as Masuria after they were colonized by Polish settlers (most of whom came from Masovia, hence the name transfer). Some parts of Galindia were also absorbed by Masovia. Nadrovia and Skalovia became known as Lithuania Minor (or Prussian Lithuania) after they were colonized by Lithuanian settlers. Later part of Skalovia became known as Memelland (this part is now in Lithuania). Sudovia (also known as Yotvingia or Suwalszczyzna in Polish) was in Poland-Lithuania and later became part of the Duchy of Warsaw and of Congress Kingdom of Poland. Also Mazovians invited Teutonic knights to fight pagan western Balts. Teutonic knights were responsible for the demise of Prussians. It's also true that pagan Balts raided neighbouring Christian lands.